With HTC officially announced the HTC One M8 yesterday, we’re sure many of you guys are eager to get your hands on the device. After all what’s not to like? The phone packs some great hardware under the hood and even sports a pretty nice metal body which feels pretty premium. Those are some factors that people take into consideration when thinking about a new phone, but at the same time there are those who worry about things like durability and repairability. After all no one likes spending a lot of money on repairs if they can help it, right? Well according to a recent iFixit teardown of the brand new HTC One M8, they have found that the HTC One M8 is pretty damn hard to repair and have given it a 2/10 based on repairability, with 10 obviously being the easiest to repair. According to their reasoning, this is because it is extremely difficult to open up the phone without risking damage to the rear casing. They also claim that because the battery is adhered to the midframe of the motherboard, it makes it pretty difficult to replace as well. They also cite how the much trouble is to access the display assembly, making common repairs like screen replacements very difficult. To read more and for the original story follow the source link below. 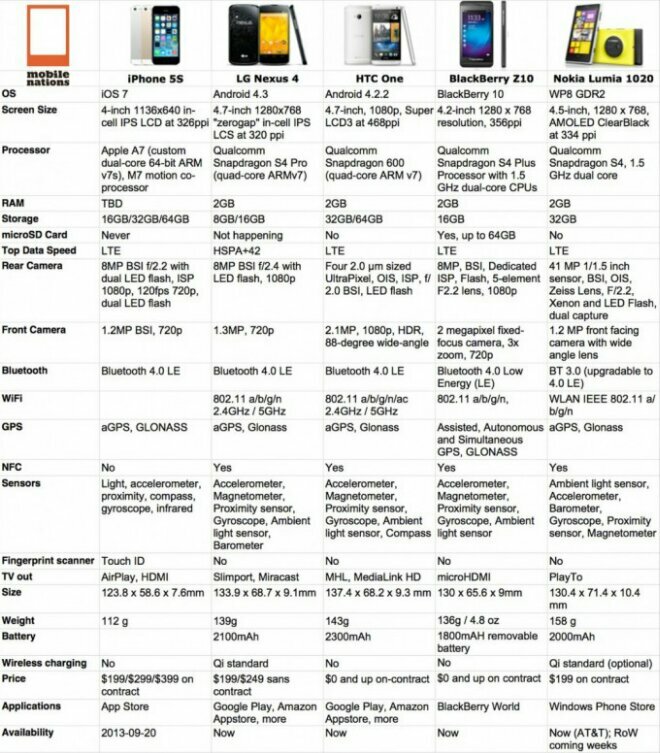 It’s no secret that Apple has just unveiled its latest devices, the iPhone 5s and 5c, and while our friends over at iMore dive deeper into the Apple-centric coverage we want to see how its latest device’s specs stack up against the Android hardware. Going head-to-head with Google’s (admittedly 11-month old) latest reference device the Nexus 4 and the HTC One, the iPhone 5s stacks up pretty comparably. The latest iPhone sticks with the 4-inch 326 ppi “Retina” display, matching up to the 4.7-inch 320 ppi of the Nexus 4 and absurdly nice 4.7-inch 468 ppi of the One. On the camera front Apple has moved to an 8MP BSI camera much like the Nexus 4, but with larger pixels like the One and a few new features included in the form of software optimization, a new image signal processor and dual LED flash. The rest of the specs round out very similarly as other high-end devices out there today, but there are naturally a few points where each device stands out. Stick around after the break for a full spec-by-spec breakdown of the iPhone 5S vs. the Nexus 4, HTC One and the latest BlackBerry and Windows Phone handsets.